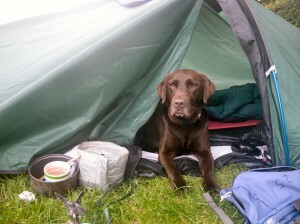 Poppy is a chocolate Labrador who came to stay, via Labrador Rescue. Poppy came to us from a family with 6 children and she had very soft paws, which we felt meant she hadn’t been walked very much. Her love for children has not changed but her paws have certainly hardened up. She has accompanied Joy on various long distance walks including the Coast to Coast and Offa’s dyke as well as various canoe trips, but is equally keen to try and follow her in a sea kayak (which we can confirm is a little more difficult).